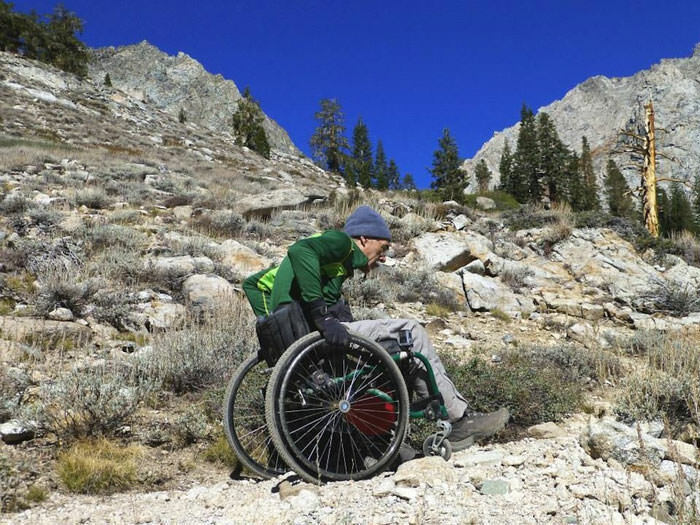 Crossing the Sierras…In a Wheelchair? I woke in a tent on September 17, 2014, anxious to begin what was to have been an epic journey. 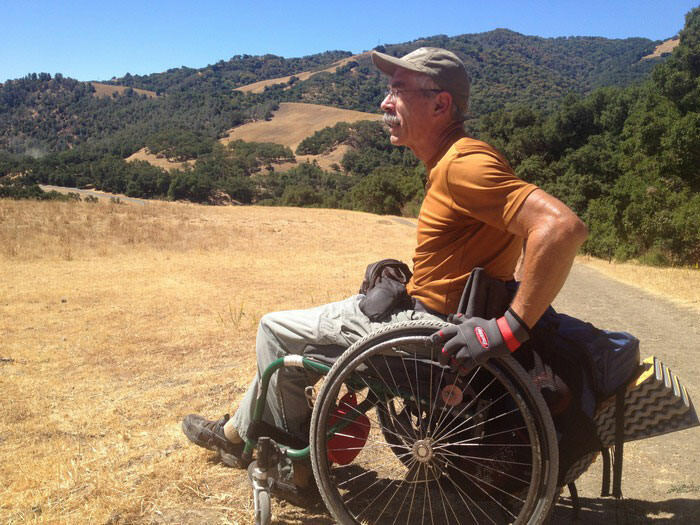 Though I've established quite a few "first summits" for someone in a wheelchair, a 22-mile one-way crossing of the Sierra Nevada mountain range via Kearsarge Pass—at nearly 12,000 feet—might seem an overwhelming challenge. There was no telling what was ahead as I began from the 9200' Onion Valley on the east side of the Sierra. But, as with most of the things I do when out exploring, I know that I'll never find out until I place wheel to rock and venture out. I was accompanied by a film crew chronicling the expedition for an upcoming documentary entitled 4 Wheel Bob. Almost immediately, the trail became demanding. Though wide enough for able-bodied hikers to pass each other, there were narrow pinchpoints that required I dismount from my perch hundreds of times just to get over obstacles. I dragged myself and my chair over impediments that would appear simple to a hiker who could bound over them without a hitch in their gait. But I was ready—years of gym training and outside experience prepared me for the trip. Using lightweight and very tough gear helped, as did managing my blood sugar levels. (I'm a Type 1 diabetic.) I expected to proceed along the rocky, boulder-strewn trail at a pace somewhere between snail and sundial. By Day Three of our journey, we had covered just three miles, or close to it. The in-and-out of the chair action was constant, as was the grabbing onto rocks with the same gloved hands that were being worn by the extreme process of grasping the wheels, pushing or pulling over a bump or boulder, and setting up for the next obstacle. Our many stops to apply first aid measures to the blisters and hot spots on each hand brought us to the realization that there may, indeed, be a limit for a single trip. On the afternoon of the third day out, I confronted a field of huge boulders just as we were about to arrive at the Gilbert Lake campground. I tried to pull my chair over the boulder mess but found that a monster obstruction in combination with my blistered, bleeding hands made this my turnaround point for the season. There was no way to safely proceed, and I tend to try to be as risk averse as I can. I was ground up by this trail, though not defeated. It would be hard to describe myself as disappointed; instead, my education about Kearsarge Pass had increased exponentially. Within a few days I was already consulting hiker friends in preliminary talks about the "hows" to make it up and over the Pass. It was exciting to get as far as I did and even as I was grinding out each and every single push toward the Pass, I felt great. Though I have a very prudent, safety-borne streak in me, there won't be any "quit!" Once my hands are fully healed, I know I'll be back looking for new methods that will help me make this, or another tough hike, happen. Because once an outdoorsman, always an outdoorsman—only the means of achievement have changed. My expectation will always be that each venture out will be a success, no matter the difficulty, no matter the obstacle. The "4 Wheel Bob" documentary film, due out in 2015 is produced and directed by award-winning filmmaker Tal Skloot. According to him, the Kearsarge Pass experience "was dramatic, exciting and amazing to watch Bob's determination, as he put in ten hour days in his relentless pursuit of getting up the mountain. There were heartbreaking moments, a real feeling of community among fellow hikers and some great humor as well, as people passed by with dropped jaws." "I think this is going to be an amazing documentary film which will illustrate the struggle, determination and perhaps the truth about coming up against and accepting our limitations," said Skloot. "Bob is truly an inspiration to everyone who meets him." A wonderful photo essay of the climb by Getty Images photographer Ezra Shaw is featured here. For more on the film, visit https://www.kickstarter.com/projects/1678847669/4-wheel-bob.